Love tasty egg dishes? 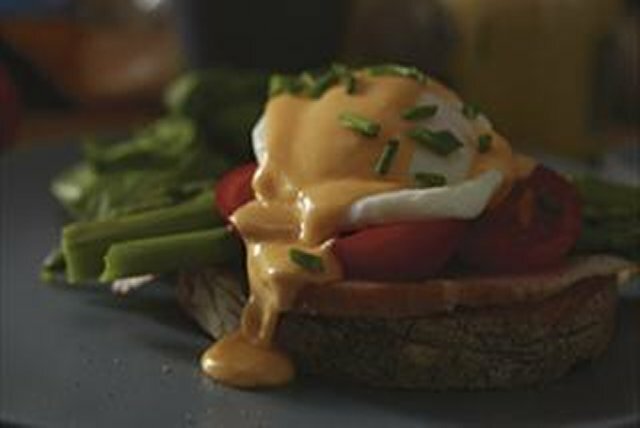 Then this amazing Bright-Side Benedict recipe belongs in your life. Enjoy it the next time you make brunch! Cook Singles, milk and mustard in saucepan 2 to 3 min. or until Singles are melted and sauce is well blended, stirring frequently. Cover toast slices with ham, tomatoes, asparagus and eggs; top with sauce and chives. Serve with fresh fruit and a glass of cold fat-free milk to round out the meal. Carefully slide eggs into gently simmering water in skillet; cook 3 to 5 min. or until whites are completely set but yolks are still runny. Remove with slotted spoon. For best results, avoid precooking and reheating poached eggs. Mix sauce ingredients in microwaveable cup or bowl. Microwave on HIGH 1 to 2 min. or until Singles are completely melted and sauce is heated through, stirring after each minute.